These Soft Sugar Cookies are some the softest and chewiest cookies that you have ever had! They are made with a recipe that is almost too easy to be so delicious, so it kind of feels like cheating! They are perfect for eating just as a plain soft sugar cookie, but also over the top delicious when you add some simple sugar cookie frosting! These cookies freeze well and are great for Christmas cookies or every day cookies. Read on for the recipe, tips, tricks and helpful notes. This is an easy sugar recipe that is pretty fool-proof for creating super soft sugar cookies every time! This recipe has a few key elements that help make it really special. The first thing you might notice about this soft sugar cookie recipe is that there is no cream of tartar listed in the ingredients. Cream of tartar is an ingredient traditionally used in sugar cookies. It is not super common in many other recipes though, so many times, unless you are an avid baker you might not have it in your spice cabinet. This sugar cookie recipe is simplified by just using baking powder which is found in most household kitchens. One of the main ingredients in baking powder is cream of tartar so you are still able to get the signature taste of the best sugar cookies without having to buy special ingredients you might only use once a year! This sugar cookie recipe simplifies the recipe so that you just use the 7 basic ingredients you need to make it extra easy and so that can get the best tasting sugar cookie quickly! I hope you will be thrilled with how easy this sugar cookie recipe is! 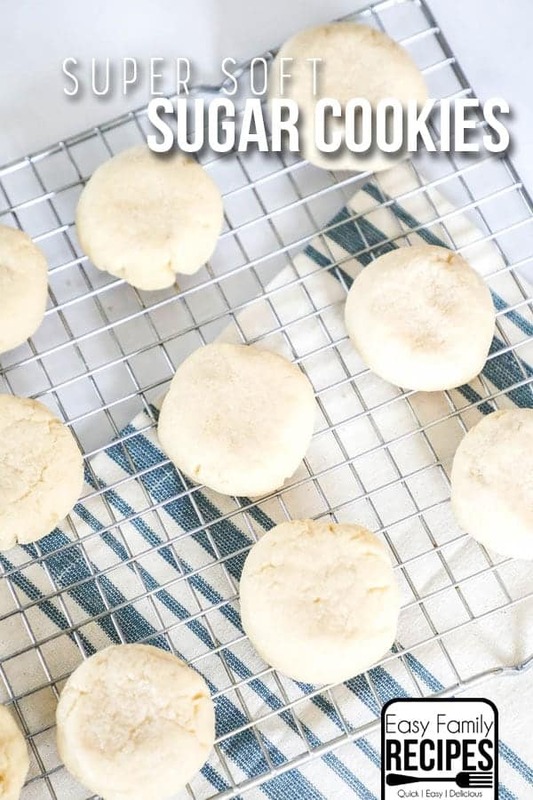 I am going to walk through the basic steps here for our soft sugar cookies and give you some important tips to ensure that you get a soft and chewy cookie every time. Make sure to scroll to the bottom of the post for a full recipe card! What ingredients do you need for soft sugar cookies? First mix the butter with the sugars. Add in the vanilla and salt and mix to combine. In a separate bowl, sift the dry ingredients together. Then slowly add them into the butter mixture, mixing between each addition, until all of the flour mixture is incorporated into the dough. The sugar cookie dough should NOT be sticky or crumbly. The dough will be stiff but shouldn’t fall apart when touched. If you find the dough sticky, add flour to the dough 1 tbsp at a time until it becomes not sticky. If the dough is crumbly, add water to the mixture 1 tsp at a time until the dough holds together. Form the dough into balls, then flatten each ball slightly into a thick disc and place on a cookie sheet. Bake the cookies in a preheated oven until they just lose their sheen. Make sure not to over bake the cookies so that they stay soft! Let the cookies cool on the cookie sheet for 2 minutes, then transfer them to a cooling rack to continue to cool. There are a few key things happening in this recipe that makes these sugar cookies so soft. First, we have the perfect ratio of flour to fats and liquids to keep them nice and thick. Since they don’t spread thin, the cookie is able to get the slight crunch around the edges, but most of the cookie stays soft and chewy nice and protected in the thick middle! Not having the perfect flour to fat ratio is the main reason why sugar cookies will spread and lose their shape rather than staying nice and thick and soft while baking. The other huge key here is not over baking your cookies. Cookies are easy to over bake because they don’t always look done when you take them out of the oven. The cookies will continue to bake as they cool, so when you remove them from the oven the edges should be done and the center should just be set and have lost it’s sheen so that it is not raw, but it is still super soft and delicious. This is the biggest mistake I see in making sure that the cookies are absolutely perfectly soft and chewy. 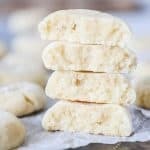 Freeze the sugar cookies– My favorite option is to freeze your cookies because this really preserves the moisture in the cookie, keeping them exceptionally soft and fresh any time you want to eat them. I will freeze cookies even if I am just serving them the next day because they really do taste just as soft and chewy as they did out of the oven once they thaw. See my section below on freezing sugar cookies for details on how to freeze them. Store sugar cookies with a piece of bread – If freezing the cookies isn’t an option, such as when you are mailing them, I like to store the cookies in an airtight container with a slice of bread. The bread will dry out first and supply its moisture to the cookies so the cookies stay soft and chewy much longer. To do this I like to place the cookies in the airtight container and put the bread on top of a piece of parchment paper or inside an open plastic bag so that the bread isn’t directly touching the cookies. Sometimes if the bread is touching the cookies it can transfer too much moisture and making the cookies soggy where it touches. What is the Best Thickness for Sugar Cookies? I like to make my sugar cookies 1/2-3/4 of an inch thick after baking. This thick center allows there to be a high soft and chewy element to the cookies. The cookies will spread some as baking so it is ideal to make them slightly thicker than this when you put them on the cookie sheet to bake. These soft sugar cookies freeze beautifully both before and after baking! This is my ideal way to keep them soft and chewy no matter when you want a cookie! By freezing the dough, you can have hot and fresh cookies on demand when ever you get the craving. If you freeze the cookies after baking they stay just as soft and chewy as they did when they came out of the oven, so you can have super delicious cookies ready to go at a moment’s notice. Follow recipe as directed up to shaping the dough into discs. Place the discs into a gallon sized zip top bag, or an air-tight container, placing parchment in between stacked layers of cookies and place in the freezer for up to a month. When ready to bake place cookies on a baking sheet (frozen) and bake as directed adding 1-3 minutes to the cooking time. Bake sugar cookies as directed and allow them to cool completely. Place cookies in a zip top bag or airtight container and place in the freezer for up to a month. When ready to eat remove cookie and either allow to come to room temperature by sitting on the counter for 5-10 minutes or microwave cookie for 30-45 seconds. Enjoy! If you want to jazz up your cookies just a little bit, there are a few things you can add to them to make them fun and festive! Frosting- These cookies are especially good with a thick smooth layer of frosting on top! After baking and completely cooled, add a layer of frosting to the cookie. This is my FAVORITE sugar cookie frosting! Sprinkles- Before baking, place sprinkles on top and lightly press them into the dough. Bake as directed. Sugar- You can roll the cookie dough discs in sugar before baking if desired. If you want cinnamon and sugar, this Snickerdoodle is FANTASTIC! Do you have more Soft & Chewy Cookie recipes? If you love this recipe and want more super soft and deliciously chewy cookies, check out these favorites! Or you can see a big list of my Soft & Chewy cookies here! I hope you get a chance to try these soft sugar cookies soon and your friends and family enjoy them as much as mine do! These soft sugar cookies are super simple to make with only 7 basic ingredients! They are not only super soft, but also chewy and perfectly tender on the side with the slightest crunch on just the edges. They are perfect by themselves, with sprinkles, or frosted with sugar cookie frosting. With an electric mixer, cream together the butter and sugar until light and fluffy. Then add in egg and vanilla and mix until combined. Use a rounded tablespoon to scoop dough then form into a ball and slightly flatten each cookie into a thick disc. Arrange 2 inches apart on a baking sheet lined with parchment or a Silpat liner. Bake at 350˚F for 9-11 minutes or until the center is just set. Cookies will continue to bake after they are removed from the oven, so they may not seem completely done when you remove them. Let cool 2 minutes then transfer to a wire rack to finish cooling. Enjoy! The dough should not be sticky and should not be crumbly. If it is sugar cookie dough is sticky, mix in flour one tablespoon at a time until it is not sticky. If the sugar cookie dough is crumbly, mix in water one teaspoon at a time until the dough holds together. Do NOT over bake these cookies. Part of what makes them soft is retaining the moisture in the cookie. The cookies continue to bake as they cool, so you will want to bake them so that the edges are done and the center is just set and loses it's sheen. It will seem soft in the center when you remove them, but as the cool the center continues to bake and ends up to be the most soft and delicious cookie. Can you use salted butter and just omit the additional salt in the recipe? I made them with salted butter last night bc it is what I had on hand and they turned out great. If anything I would just cut the salt to 1/4 tsp not completely omit because you want to make sure you have enough salt to balance the sweetness. Enjoy! Great!! Thank you 🙂 We only buy salted butter so I always worry when a recipe calls for unsalted. Did you use the same amount of salt that the recipe calls for when you just made them or did you end up reducing it to 1/4? Honestly I totally forgot so it was just what is in the recipe and it was totally fine! How long do you bake these if you use a 1/4 cup to make bigger balls of dough rather than a rounded tablespoon? I generally bake cookies that size 12-14 minutes. Hope that helps! I have cream of Tartar on hand but not baking powder. Would i use the same amount of cream of tartar as i would baking powder?